Chest tightness frequently occurs in asthma patients, either alone or with the other classic asthma symptoms such as wheezing, shortness of breath, and chronic cough. What does chest tightness feel like? You may feel you can't move air in and out of your lungs as your airways become more inflamed, filled with mucus, and the smooth muscles in your airways constrict. This feeling may also increase your anxiety and further worsen the sense of not being able to move air through your lungs. The inflammation, mucus, and muscle tightness may occur after exposure to a trigger, a specific irritant in occupational asthma, or even as a result of an exercise in the case of exercise-induced asthma. Like the other classic symptoms of asthma, chest tightness should not be ignored, especially if you do not have a previous history of asthma. Ignoring a symptom like chest tightness may lead to an asthma attack if you do not follow your asthma care plan appropriately. 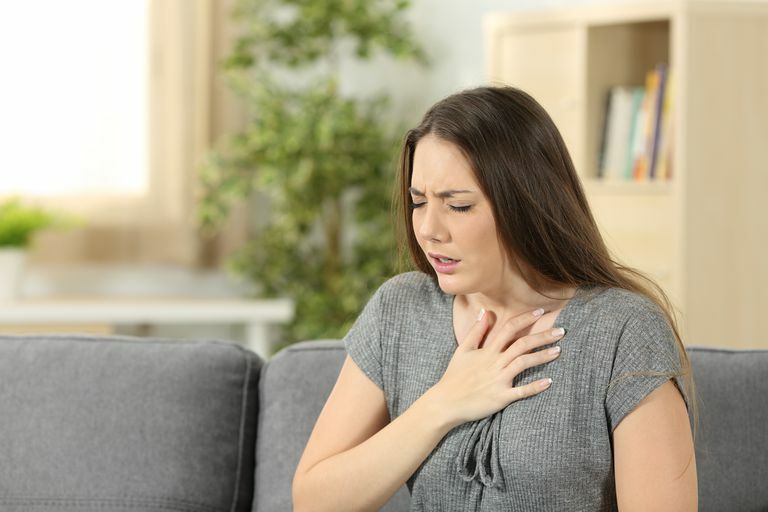 Make sure you discuss this symptom with your doctor because a number of other diseases such as heart disease, COPD, and pulmonary embolism can also be associated with chest tightness. If you are unsure of what your symptoms may mean or just want more information, consider using a symptom checker to see what may be causing your symptoms. How often do you get the chest tightness? What are you doing when the chest tightness occurs? What makes the chest tightness go away? Do other classic asthma symptoms occur with the chest tightness? What makes the chest tightness get better? What does the chest tightness exactly feels like? If you are 40 years of age or older and you have any risk factors for heart disease. If you have associated chest pain, nausea, shortness of breath, sweating, dizziness or fainting with your chest tightness. Your chest tightness is associated with physical activity or progressively worsens. You have a feeling of impending doom or that something is horribly wrong. If you already have a diagnosis of asthma, chest tightness may indicate poor control or worsening symptoms that could escalate into an asthma attack if you do not follow your asthma action plan. Make sure you understand what to do when you experience symptoms and ask your doctor specific questions if you do not understand. Allergy/Asthma Information Association. A Patient's Guide to Asthma Care. What Exactly Happens During an Asthma Attack? Is Hay Fever Making Your Asthma Worse?